I’m not sure exactly when I became addicted to the thrill of taking motorbike taxis in Rwanda but somewhere in downtown Kigali- bombing downhill, scratched up visor blurring my vision, driver crazily dodging trucks, cars and people – I realised that this was a seriously fun way to get around town. I had come to Rwanda at the invitation of Mercanta, our speciality green coffee importers, to meet the producers behind the spectacular coffee that we source from this origin. At Glen Lyon we have been huge fans of Rwandan coffee from the outset and a bag of Rwanda Musasa was on the first pallet of greens we received. It’s one of the origins I get most excited about with the amazing florals and orange notes that we find in the cup and I sometimes think that if I was forced to only drink the coffee from just one origin for the rest of my life then I would chose Rwanda. Rwanda is an astonishing country. Less than half the size of Scotland but with twice the population it remains one of the poorest nations in the world, tiny and landlocked in a geopolitical region not best known for its stability. Yet Rwanda has the highest percentage of women in parliament in the world. It’s leading Africa’s digital revolution with an initiative creating free wifi on buses, in hospitals, commercial buildings and restaurants. I never saw any litter during my visit, literally, anywhere. This is largely due to the fact that in 2007, enlightened Rwanda became the first country in the world to legislate an outright ban on plastic bags. But what amazed me most about this amazing nation is just how happy, welcoming and friendly the people are. The horrors of the Rwandan genocide happened little more 20 years ago leaving the country decimated with “a society whose soul had been shredded… where hardly a person could be found who was not related to someone who had either killed or been killed”* How a country can recover from such horrific events is beyond me. But Rwanda seems to be doing something right. In the years that followed the genocide, International aid programmes invested heavily in the region. Among them were programmes investing in improving the quality of Rwandan coffee with the construction of the country’s first washing stations. The initiative was a huge success not least thanks to Rwanda’s natural resources: Fantastic rainfall, fertile soil and plenty of altitude – it’s no coincidence the tourist board’s strapline boasts Rwanda “a land of a thousand hills”. 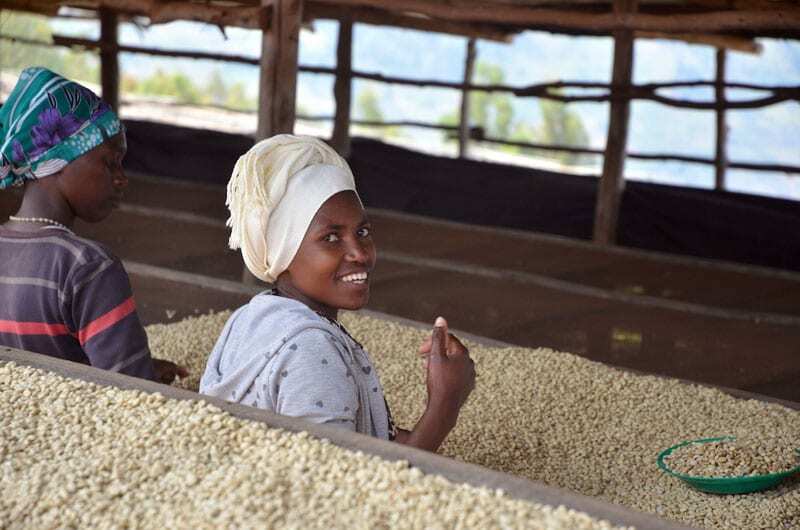 Coffee is now one of Rwanda’s top exports bringing in US$60 million to the country last year. Back in 2002 only about 1% of total coffee production could be classified as speciality and there were just two washing stations in the whole country. Today there are some 230 coffee washing stations with 45% of Rwanda’s coffee production now graded as speciality. I had wanted to visit Rwanda for a long time so you can imagine my excitement to be heading north to the Musasa Co-operative in the excellent company of Mercanta’s Raphael Prime, Jon Cowell of Campbell & Syme Roasters, the lovely Angelique Karekezi of RWASHOSCCO (Mercanta’s export partners) and Roger Niyonshuti, a man simply bursting with life and laughter and generosity of spirit. Roger was just 9 years old when his parents were killed during the genocide. Orphaned and alone he had to fend for himself working his way through school first running a bicycle taxi to now owning his own Toyota Landcruiser driving various officials, NGOs and coffee people like ourselves around the country. As we headed north out of Kigali, the city gave way to a countryside of red earth, eucalyptus and banana groves. We drove past roadside restaurants serving up skewers of goat brochette and enormous baked potatoes, women carrying impossible looking loads on their heads, horned cattle and smiling children greeting us with cries of mzungu. In populous Rwanda there are people everywhere and it often seems that every inch of the land is cultivated. As well as tea, coffee, and tropical fruit, we saw fields of cassava, sweet potato, sugar cane and sorghum. As with all roads in Rwanda, the tarmac eventually runs out and we soon found ourselves bouncing along red earth tracks. On a hillside high above Musasa washing station we met Andrew Hakizimana, a 50 year old farmer and a founding member of the Musasa co-operative, nattily dressed in a pinstripe suit and wellington boots. As well as his 3,600 coffee trees Andrew also grows bananas, passion fruit, cassava, sweet potato, tomatoes and avocado. His pride and joy, however, is the cow he received as a gift from Musasa. He now sells the milk for extra income and uses the manure to help fertilize his coffee trees increasing production and quality. Later in the week we headed south towards Butare joined by Sam Muhirwa of Buf Café. Sam’s a bit of a legend in the world of Rwandan speciality coffee and it’s not difficult to see why. Apart from being a genuinely lovely person he produces consistently amazing coffees from his washing stations at Nyarusiza and Remera. He’s not afraid to try out new techniques either and has begun experimenting with naturals and different drying techniques. At Remera or “Lemela” as Sam often called it (Rwandans have a endearing trait of randomly interchanging their Rs and Ls) the last of the harvest was still coming in and it was great to see the washing station in action. We have loved the lots that we have had from Buf Cafe in the past and this year’s crop look set to be an epic one. After days of full-on coffee immersion it was a little ironic to stay the night in the middle of a tea plantation at the divine Nyungwe Forest Lodge where we shared the dining room with none other than the President’s wife. The only thing that could have disturbed my sleep in Rwanda’s most comfortable bed was the 5.5 magnitude earthquake that shook the whole country awake at 3am. Dragging ourselves from the luxury of Nyungwe we headed north and west to Lake Kivu where coffee plantations, such as Kamajumba, grow right down to the lake shore and could easily claim the title of having the most beautiful setting for a coffee farm… ever. Having cupped these Kivu Belt coffees earlier in the week at the RWASHOSCCO offices back in Kigali I can vouch for their deliciousness. Despite producing arguably the world’s best coffee it seems a shame that Rwandans themselves drink so little of it. This could be about to change as a number of specialty coffee shops such as Neo and Bourbon are starting to establish themselves in Kigali where you can now order a V60 pourover alongside your beef samosa. For now though Rwandans still prefer to drink tea, beer and infinite varieties of Fanta. Oh and Waragi, of course. Aka “War Gin”, Waragi is a clear liquor, distilled in Uganda and guaranteed to get you very merry indeed. Just opening a bottle of this stuff and you know the night won’t end until you’re on the dancefloor at 4am in a joint called something like Rosty Plus before heading home on the back of a moto-taxi revving it up through Kigali as the sun comes up. As I said, Rwandan motorbikes, just like the coffee, have become a bit of an obsession.